Well, 2018 has almost come to an end and we hope it’s been a good year of fishing for everyone. If you captured a few new fishing memories on your phone and are willing to share on social media, we encourage you to post them using #wefishak. And if you’re not following us on Instagram, we invite you to do so @wefishak. Be sure to check out other angler’s fishing pics by searching #wefishak on Instagram. You can also follow us on Facebook at ADF&G - wefishak There are some great images of Alaskan anglers on these sites. As a reminder, your 2018 sport fishing license will expire at the end of the day on December 31. Remember to purchase your 2019 sport fishing license. We encourage you to buy your 2019 fishing license online. If you buy your license online, a .PDF copy will be emailed to you. That way, if you ever lose your license, you can simply print another one off. And don’t forget! 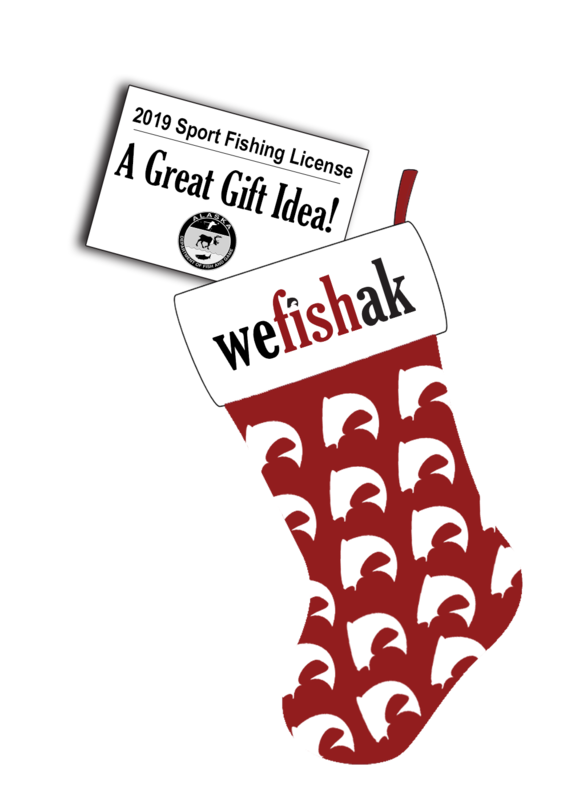 A sport fishing license also makes a great gift for the holidays. From all of us here at the Alaska Department of Fish and Game, we wish you happy holidays and great fishing. Get out and fish. Together. Tis the season! The snow is slowly creeping down the mountains, there’s a cool crisp breeze in the air, and frantic shoppers have started scavenging the stores. It’s that time of year again, Christmas is right around the corner! As the temperature drops and the clarity of the water intensifies, the fish enthusiasts long for their next fishing season. These avid anglers cannot wait to wet a line and hook their next catch. Sound familiar? Do you know of someone who is itching to get out and fish Alaska’s pristine waters? If this sounds like someone you know, we have the perfect gift idea to make your holiday shopping easier than ever. This holiday season shop the ADF&G’s online store for gifts for your family and friends. Maybe even drop a hint to your family about this awesome, thoughtful and practical gift idea for yourself. It is extremely easy to go online and purchase licenses, king salmon stamps, and an array of other items for the 2019 season in one fell swoop. If your entire family has made the nice list, simply click ‘Select Another Customer,’ to add more than one person at a time to make the process quick and painless. If you plan to purchase a sport fishing license for someone else, be sure to have their necessary information in order to complete the transaction (Name, address, driver’s license number, date of birth, etc.). Then, print off these great gifts and slide them into a Christmas card for someone special or make it a surprise that’s hidden in the tippy toe of their stocking. Beat the crowds. ADF&G wants you and your family’s holiday season to be enjoyable, relaxing and stress free. Give the gift that brings joy all year long. 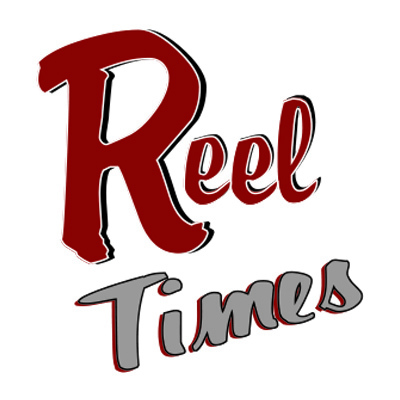 Be on the look-out for a few changes coming to Reel Times in 2019. Below is a short list of some of the things you’ll see in January. 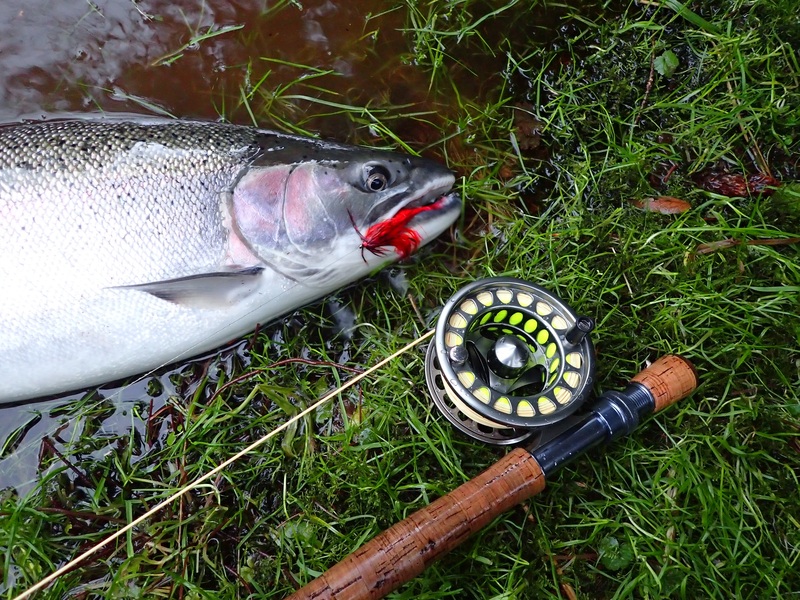 In Southeast Alaska, steelhead fishing is generally thought of as a spring time activity. However, there are select drainages that have fall or winter steelhead runs. These drainages usually have a lake present where the fish can escape low water flows of winter. Many drainages in Southeast Alaska have small steelhead populations of less than 200 fish as determined by snorkel surveys and weir counts that occur in the spring. Snorkel surveys consist of biologists floating rivers and creeks in dry suits to visually count steelhead. Weirs are used to count steelhead as they enter (immigrate) and depart (emigrate) drainages. It is known that weirs on drainages with lakes undercount immigrating fish since an unknown number of steelhead entered in the fall and winter but still spawn in the spring. Very little is known about fall/winter steelhead population dynamics, but it is apparent that the numbers are much smaller than spring fish numbers. For anglers wishing to target them, fall steelhead begin entering drainages in late October and continue to trickle in throughout the winter. During mild winters, such as we experienced in 2014-17, anglers may catch steelhead all winter long. Mild rainy winters keep water temperatures up and provide fluctuating water levels which are favorable to fish entering drainages from salt water. In addition, fish that are in freshwater are more likely to spend time in rivers and creeks where they are more susceptible to anglers than in lakes. Colder water temperatures and low water associated with cold winters may discourage steelhead from entering systems and fish that are present are likely in protective lakes, lethargic and less likely to bite. Until research is conducted on fall and winter steelhead our understanding of this aspect of steelhead biology will remain limited. However, this unique aspect of steelhead biology provides an opportunity for anglers to extend the fishing season through the winter. If there is a stretch of mild weather this winter, it may be worth an angler’s time to hit the water and try for winter steel. Campbell Point Lake, or Beer Can as it’s known to longtime Alaskans, is an ideal local ice fishing spot in Anchorage. It’s located in a fairly secluded area within Kincaid Park, surrounded by woods, and offers that “away from the city feel” without the long drive. Take Raspberry Road to the Kincaid Park entrance and turn right at a sign marking the dirt road to the lake. Drive about .5 miles to a designated parking area and the lake. This lake is a great place to take the kids without having to trek too far across the lake to drill some holes. Those little legs tire quickly especially dressed up in all their winter gear. Don’t forget you will be hauling a bit more gear than when fishing during the summer. Typical ice fishing equipment includes winter gear, an auger, ice scoop, couple ice fishing rods, bucket (works great as a seat), lures and bait, foam mat or cardboard boxes to stand on or kneel on (standing on cold ice can seep through even the warmest boots), and a sled to pull it all. For those more diehard ice fishermen and women, extra gear may include a tent, heater, depth sounder, underwater video camera, tip-ups, and so much more. Have you always wanted to give ice fishing a try but overwhelmed and want to “try before you buy?” Some ADF&G offices have fishing equipment to loan through the Rod Loaner Program. Some offices have ice fishing equipment such as ice fishing rods, hand-crank ice augers, buckets, ice scoops, and jigs. Contact your local office to find out if they have fishing gear to loan. Ice thickness fluctuates and can vary depending on the lake and location. Please use extreme caution when ice fishing throughout the season, especially on larger lakes, and realize that many lakes in Southcentral Alaska have underwater springs keeping ice thin. Anglers are reminded that ADF&G does not monitor ice thickness. A bathymetric map of the lake and other local lakes can be found on the ADF&G Lake Fishing Information webpage. Campbell Point Lake is stocked throughout the year with bigger rainbow trout, broodstock Arctic char, and catchable Chinook salmon. Chinook salmon are aggressive feeders and will capture kids’ attention and provide success in little time. 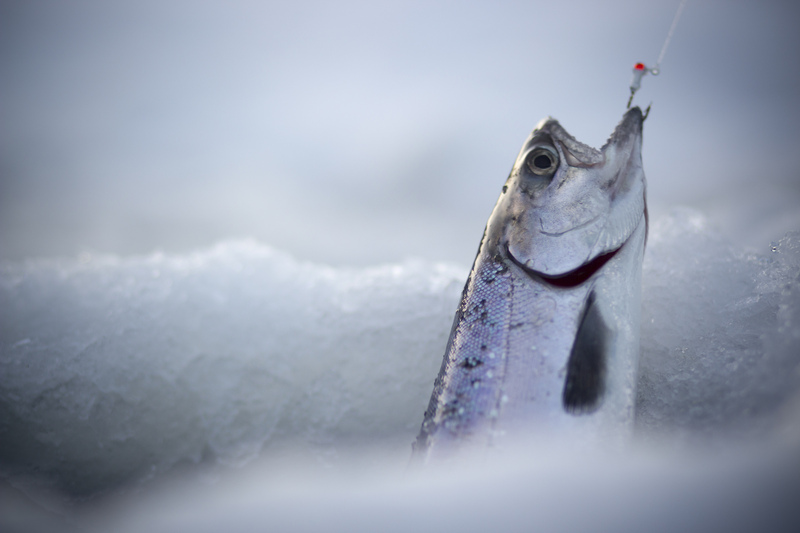 Ice fishing is typically good in about 8 to 14 feet of water; however, where you fish will depend on the fish species you are targeting. Rainbow trout tend to be closer to the surface and Chinook salmon and Arctic Char are generally located near the bottom of the lake. A common issue for beginning anglers is that they don’t let enough line out to get their offering deep enough. Make sure you get your hook and bait well below the ice. ADF&G recommends you bring a variety of lures, flies, and bait to change it up, such as shrimp (use tiny pieces) and single salmon eggs. Bobbers are ideal for kids as a colorful bobber is easier for them to watch than clear fishing line against the snow, ice, and water. There is so much joy in watching your kids set the hook on their wiggling line and seeing their faces light up and hearing their laughter echo off the woods because they caught a fish. Just a reminder you need to have the current years sport fishing license in your possession while ice fishing. Your 2018 sport fishing license expires on December 31, 2018. Alaska resident kids under 18 years old do not need a sport fishing license. 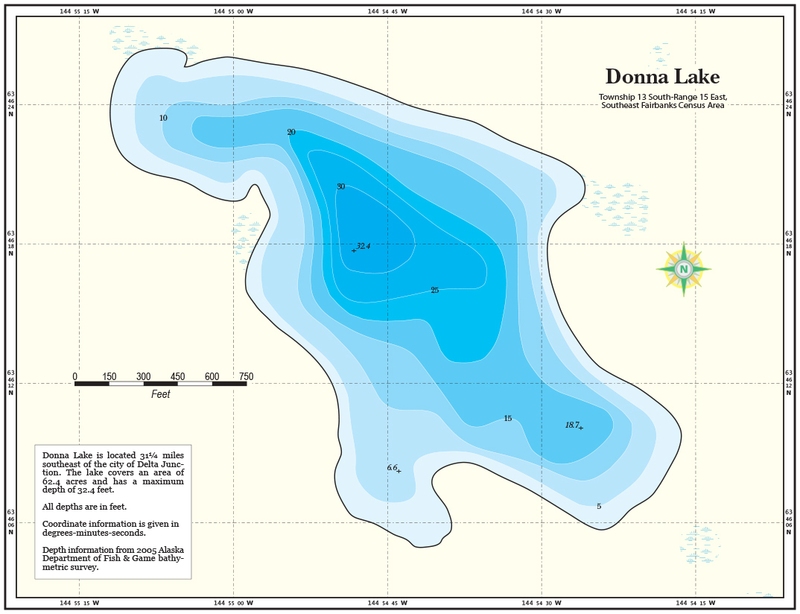 Donna Lake covers 58 acres and is one-half mile in length and is 36 feet at its deepest. Little Donna Lake covers 47 acres and has a maximum depth of 28 feet. Staff from the Ruth Burnett Sport Fish Hatchery in Fairbanks stock these lakes with rainbow trout. When heading out to fish these lakes, before you take along plenty of bait such as squid, small pieces of nightcrawler, raw shrimp, or salmon eggs. If lures are your preferred method, lead-headed jigs and small airplane jigs work well. Donna and Little Donna lakes are about 130 miles from Fairbanks. Take the Richardson Highway south to Delta Junction; then the Alaska Highway to Mile 1391.8 (this is about 1 mile after crossing the Gerstle River Bridge.) The trailhead is on the right (south) side of the highway. Snowmachine, snowshoe, or ski on the trail for 3.35 miles to Donna Lake. To access Little Donna Lake continue on the trail past Donna Lake for 1.3 miles. Trail and lake maps are available at ADF&G offices on College Road in Fairbanks. 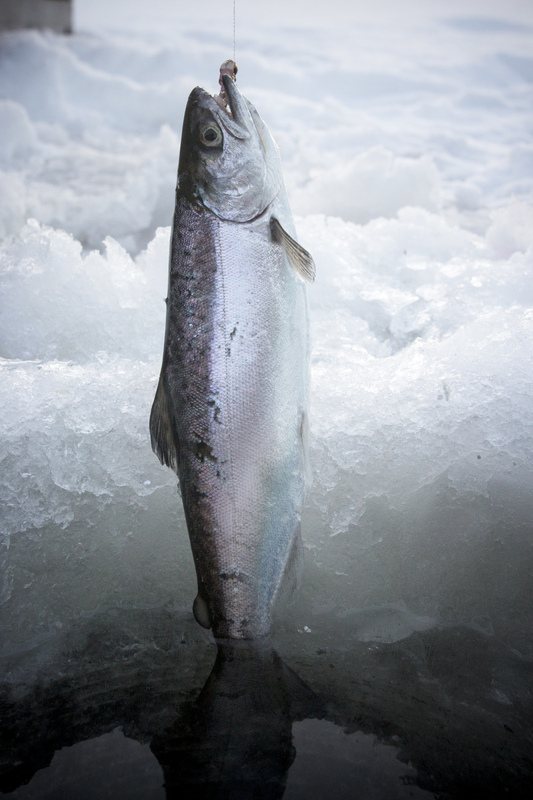 Ice fishing tip: Have you ever accidentally kicked your ice ladle down your fishing hole? Has one of your kids ever dropped your lucky pole into the murky depths of your favorite lake? Try tying an empty, capped, plastic water bottle to your ladle and the kids’ ice rods. When that well-placed kick sends those hole-seeking items across the ice and down into the water, the home-made bobbers will keep them afloat at the top of the hole for easy retrieval. Give this recipe a try. If you don't have a whole salmon, try using this recipe with a rainbow trout or Arctic char.